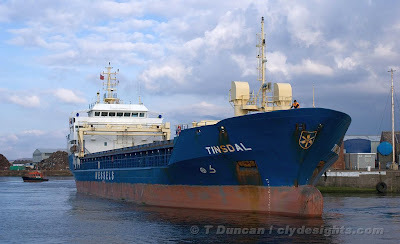 Seen as she was departing from Ayr Harbour, the German-owned coaster TINSDAL had been delivering a cargo of fertiliser. TINSDAL, managed by Wessels, had recently changed flags from that of Antigua and Barbuda to the parent German register. She was built in Romania by the Rousse Shipyard, taking to the waters of the Danube in 1998. She is 89.9 metres in length, with a deadweight of 4,310 tonnes.